9/17 – back on the road this morning for a 14 mile stretch to Mealhada, known for a local brand of wine, and broiled suckling pig – yes, the whole little piggy, from his little pink head to his little curly tail! Our walk was mostly flat and went through several small towns. We are getting used to the townsfolk answering our Bom Dia with a Boa Viagem! (Sounds like Bon Voyage, but spelled funny – silent “m”) to which we respond with a thank you. Lots of smiles and encouragement. My Nice Person of Portugal today is the lady who runs the cafe where we stopped for a mid morning espresso. Whenever we stop for a break, I always use the facilities, as you never know when the next opportunity will be. I didn’t see a WC sign in the cafe, so I asked, thinking maybe it was in the back. In response, the lady motioned me to follow her out the door, and down the street, where she ushered me into her home to use her bathroom! How nice was that? 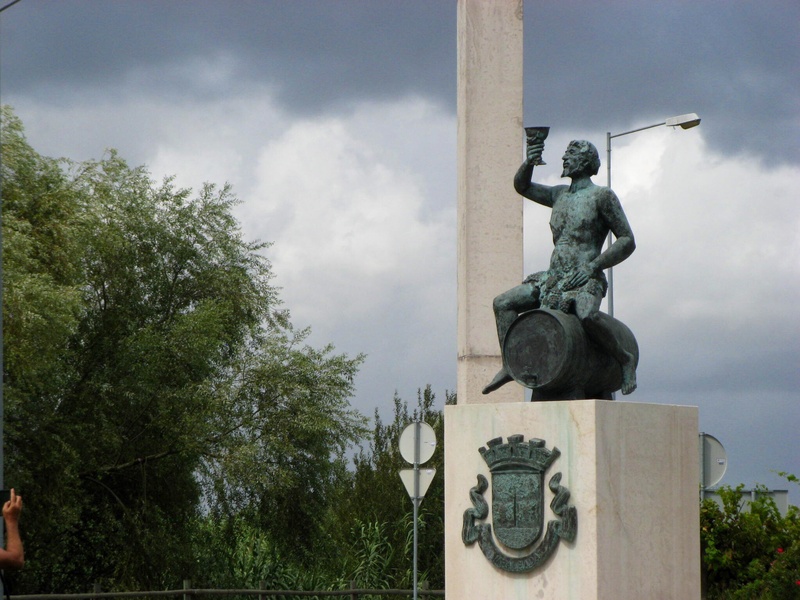 The town of Mealhada welcomes you with a statue of Baachus, god of wine, and grapevines in the square instead of flowers. By the time we got there, the rain that had been threatening all day, started coming down. Our last residencial had very poor wifi – we had to sit on the stairs in the hallway to get any reception – so today Jim suggested we stay at the alburgue. After all, who knows more about the needs of pilgrims? We walked through Mealhada and out the other side, passing pensions and residencials, before finally getting to the alburgue. They were out of private rooms, so we could either stay in the dormitory (16 bunk beds in a row with shared WCs), or walk back through town in the rain. We opted for the bunk beds. Luckily there were only 6 of us, and Jim was the only snorer, so we had a surprisingly restful night.